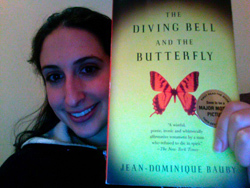 Over the weekend, Evan’s grandparents recommended that I read The Diving Bell and the Butterfly by Jean-Dominique Bauby and gave me their copy. Although I’ve been hearing the name thrown about for a while and now there’s a film of it, I didn’t really know what it was about. It’s a small book with large type, and I decided to give it a go on Monday afternoon over a cappuccino at Brasseria Al Hamra, a bright and cozy cafe with a cheerful landscape mural and two modern marble fireplaces. And from the moment I started, I knew I’d be staying put until I finished the book — or until they kicked me out, whichever came first. Thankfully, I didn’t get kicked out, and I spent about two hours completely engulfed in Bauby’s story of suffering a massive stroke and living with locked-in syndrome, his only way to communicate with the outside world being by blinking his left eye. He talks about his flights of imagination while trapped in his body, his memories of his past life, which was cut extremely short at 43, and how he managed his day-to-day life, from going through therapy and bathing to accepting visitors. I was quite overwhelmed by sadness while I was reading. I felt like I was in his mind with him, feeling his frustrations. And it also made me think about what it would be like if someone I loved were in such a situation. He often focuses on his children’s visits, which are particularly sad. I can’t wait to see the move and see how they adapted this story to the screen. And though I don’t always like stories that make me sad, this is one I feel is important. Maybe it’s because it’s true. Maybe it’s because despite its sadness it’s still full of hope — and not a religious, superstitious, “this is the way things are meant to be in the universe” kind of hope, but a survivalist, human and parental kind of hope. Fittingly, though, Bauby died two days after this book was published in France. Are you sold yet? Go check it out — it’ll only take a bit of your time to read, and it’s sure to leave a lasting impression. And if you’ve seen the movie, let me know what you thought about it.